our daughter in Georgia was in a long-distance relationship with her boyfriend in Chicago. 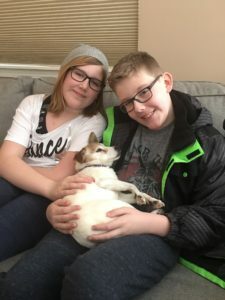 One weekend, when he was visiting, they toted a tiny Jack Russell puppy to our home in a cardboard box and announced they were going to share a dog together. Our daughter was to be the main caretaker while a full-time college student and working as a barista at Starbucks. I remember my husband and I meeting with them on our screened in porch. Calmly, but firmly (maybe sternly), I remember telling them that getting a puppy was a crazy idea. 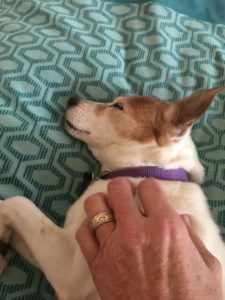 My husband and I reviewed things like cost of dog food and vet care, and we spoke of the unfairness of a dog spending long hours alone in an apartment while our daughter went to school and worked. Fast forward to this month, January of 2019. That little dog, named Baby, passed away at the ripe old age of 14 1/2 years old. You see, our daughter married that boyfriend, then they had two precious kids and became an amazing family, with great choice in pets, I might add. Baby has been with them every step of the way. A year before she died, when I was visiting them in Chicago, Baby was showing enough signs of old age that I knew it was the last time I was going to see her alive. I crouched by her dog bed, stroked her gray head, and sobbed while I said good-bye. I knew right then I was going to someday write this post. Under the watchful eye of my son-in-law who was in the room, I asked that dog’s forgiveness for the stern logic I had doled out to her parents after peering over a cardboard ledge and seeing her for the first time. I asked her forgiveness for using every ounce of persuasive ability I had at the time to talk her young parents out of keeping her. 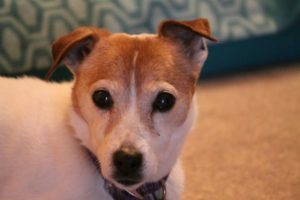 Turns out, she was a great dog and our entire family loved her. Right there next to the dog bed, down low on the living room carpet, I was reminded that I know NOTHING about what God wants to do with people’s lives and what decisions each is to make. I must set people free so God can have His way with them. I have become increasingly committed to a principle I often choose to live by in my relationships with others. Unless I see something that is in direct violation of God’s Word — of which keeping Baby was not — people get to run their lives. If I am asked my opinion, I share freely, but not with an attitude that I know best. I don’t know God’s Story. I am simply never that good. Truly, this dog is part of what God has used to keep me in my rightful place. I am not God. I don’t know it all. And often, God’s ways are not logical and safe and controlled. Baby has made me better. Though she is gone now, this story lives on. I lived it, and it changed me. Picture Explanation: Baby, and baby with her family over the years. What little I knew when we took in that Baby dog and how greatly life has changed since then! Your words are truly honoring her memory. Thank you, Momma. I cried reading this! Momma does such a great job in her words pictures abs actions helping us remember how God truly leads our lives! Aww, sorry I made you cry! I watched our dog grieve when our other dog died. It’s a real thing. I can only imagine what Bear has felt like. Letting God be God and waiting in the wings with you, friend. Thank you, Laurie, for these words. We have all been on the receiving end of hearing what others think God’s will is for us when the issue does not involve violation of God’s Word. It feels “yucky” and intrusive and confusing and wrong. It’s good to feel these things sometimes because it helps us to be more sensitive when we are stepping into God’s role. We really do need to be sensitive to the Spirit’s leading as we listen to others! Love you, Friend. As you know, I have been on both ends of this scenario. Hopefully more of us will land on the side of letting God be God as we become painfully aware of how little we really know compared to all there is to know. As frustrating as it can be to not get validation from others, you don’t know where my life is headed and neither does anyone else! This was so beautifully put momma. I love you, sweet one. God gets to have His way. You have belonged to Him ever since the day I found out about you. I love this post! It is a great reminder to let God work in our children’s lives instead of keeping them from making mistakes! They learn and grow in their relationship with the Lord through their mistakes. I wish I had understood this better when my children were young! Two of my children’s families have just gotten dogs. Your post makes me want to love these puppies well! Thank you for your heartfelt post containing great wisdom! Comforting words from one of the best mothers I know. Thank you.